Place this rustic end table next to your favorite seat for a casual, functional design. A dark, natural finished metal base features x-shaped legs and rivets in the table edge. Rough sawn planks create the table top that is finished in a beach color. Pair this table with the other coordinating occasional tables to complete a living space you are sure to love. 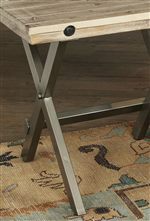 The Callista Rustic Casual Square End Table with Metal Details by Largo from Bullard Furniture. We proudly serve the Fayetteville, NC area. Product availability may vary. Contact us for the most current availability on this product. Warranty Products warranted to be free from defect in material and workmanship under conditions of normal household use only for the first year from the date of sale to the original consumer purchaser only. The Callista collection is a great option if you are looking for Rustic Rustic furniture in the Fayetteville, NC area.